6:00 am my alarm goes off. Ugh, of course my initial thought is that I want to go back to sleep. But I am one of those crazy people who love to run. I always have. So, after I wake up and start getting my “running gear” on (I’ll explain the quotes later), I start to feel good. And then I look outside. Everything is soaked. Still raining, soaked. Usually I do not like the rain (who does?) and it puts me in a bad mood. I mean, I eat so many sugary sweets, I’m bound to melt, right? But when you don’t have makeup on, haven’t showered yet and hair is pulled back in a pony tail, who cares? And birds were chirping! I love hearing the birds in the morning. For this reason, out I went. Obviously, I’m not made of sugar, therefore I’m writing a blog about running in the rain. Having to jump over puddles was pretty fun, too. Definitely made it a more difficult run. I am by no means, an advanced runner. I’m fairly slow, actually. This morning I ran a 5K, 3.1 miles, in 31 minutes and 24 seconds. My goal is to do it in 28 minutes or less. I know I’ll get there, it just takes time and dedication. The green track jacket has pockets for my phone, which I also put in a ziplock bag so it wouldn’t get wet. I do not remember where I got the jacket, it is seriously like 8 or 9 years old. 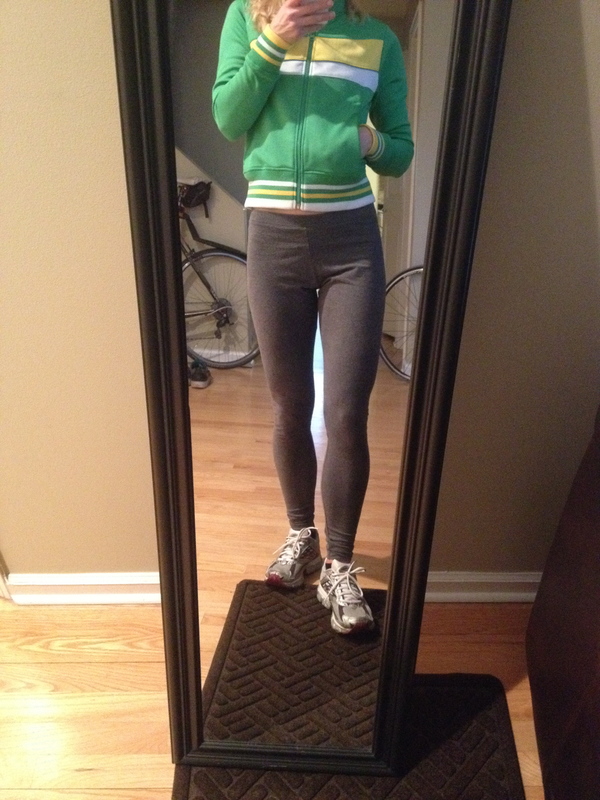 The grey leggings are yoga pants from Victorias Secret, and the shoes are Brooks Glycerin 8 which I love! I really like how Nike running shoes look, but I have wide feet and Brooks fit me better. Function over fashion here, people! Which brings me to why I put running gear in quotes earlier. There is no need to spend hundreds of dollars on work out clothes. The only items you really should research and try on is a good shoe, and a sports bra if you’re a woman. Then all you need is a t-shirt or tank top and stretchy pants and you are good to go. I really like Target for activewear. Their C9 line fits well and is inexpensive. If you do not like to run, don’t do it. Simple as that. There are so many other cardio workouts, you need to find one that you actually enjoy doing. For me, running is a great way to clear my head and I just love the physicality of it. I like that I am in a competition with myself and I don’t have to rely on anyone else to finish the race.